Two months ago, I wrote an overview of the four IES categories of research recommendations for achieving school turnaround (see IES Practice Guide: Turning Around Chronically Low Performing Schools 2009). Last month I posted an entry on one of the recommendations: sending a signal for dramatic change along with strong principal leadership. This month I want to share some thoughts about the second category of recommendations: maintaining a consistent focus on improving instruction. It is easy as a principal to spend time on the operational aspects of school and ignore instructional leadership functions, since operations are more immediate and consume lots of hours. However, for teaching and learning to improve, the principal needs to devote the majority of his/her efforts to instruction. If you are a principal, you’ve heard this argument before and already spend most of your time juggling multiple demands. Still, there is not a substitute for school leadership paying attention to instruction and monitoring the extent to which students are learning and progressing. There are a number of ways to maintain a consistent focus on instruction. One is to ensure that the interactions you have with teachers, even if they are brief, are instructional in nature. Research on principal behavior notes that the average principal – teacher interaction, in the halls, lunch room or elsewhere on campus, is about 10 seconds in duration. So what you say as principal matters. It might be a quick question about a literacy initiative your school is implementing, or a comment on student work products you noticed in the hallway, or a reaction to an insight a teacher shared during a professional learning community meeting or in a blog post. Regardless, your faculty knows you are busy. They learn about your priorities from the things you focus on when you talk to them, however briefly. Another way to maintain a consistent focus on instruction is to spend time in classrooms. I don’t mean necessarily with an observation checklist although that can serve a purpose as well. 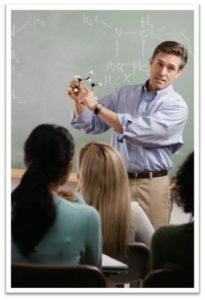 I’m talking about observing students at work, talking with them informally about what they are learning, leading a class discussion or teaching a model lesson that illustrates the kind of classroom practice you expect from teachers. Spending time in classrooms also provides an opportunity to talk with teachers about what patterns you’ve observed, and to raise questions that prompt teacher inquiry into their own practice. Plus, there is the symbolism of your making the classroom a priority that is hard to miss and that speaks volumes about what is important to you. A third way is to work with teachers examining student work and reviewing other student data to determine progress. This kind of review should occur regularly, creating a school wide habit for monitoring results. As principals we look for engaging instruction in the classroom, teacher collaboration, emerging leadership and a host of other indicators that teachers are performing at high levels. All of these indicators are important but are not a proxy for student learning. The bottom line in education is student results, and as prinicpal, there is no substitute for an unwavering emphasis on those results. Holding yourself and your faculty accountable for student learning is paramount. This entry was posted in Blog and tagged communication, leadership, turn around. Bookmark the permalink.